It should be said that I don’t really like it when movies go out of their way to explain why there are supernatural things happening. 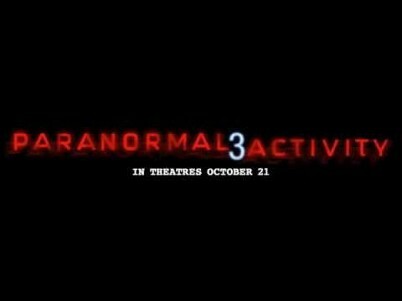 Paranormal Activity 3 serves as a prequel to a parallel prequel (a paralequel? ), as we’ve gone back in time to see two sisters’ being pestered, harassed, and frightened by an invisible bugaboo while video cameras take it all in. In this film, we get an explanation for the demon’s comings and goings, which I could do without, but after seeing hundreds of people scream in terror at the last 10 minutes, which is the exposition of the series, most are going to shrug it off, or not think too deeply about it. Hey, scary is scary. Paranormal Activity 3 is directed by Henry Joost and Ariel Schulman, who brought us the conversation-starter Catfish last year. Catfish’s letdown of audience expectations can be taken two ways, either you go, “WTF? Really?” or you think it’s an interesting dissection of how your hopes and fears can drop you into a mysterious shock when neither are fulfilled. Whatever the case may be, Joost and Schulman are perfect directors for a series that has consistently slow-burned its horror rather than cheapening it by ramping up its jump-scare count and bloodletting. In this chapter of Paranormal Activity, we’re back in the 80’s and in the age of VHS. Katie (played by Katie Featherston in the first two and by Chloe Csengery as a child in this one) and her sister Kristi (Sprague Grayden, first 2, and Jessica Tyler Brown, kid) are living with their mom Julie (Lauren Bittner) and her videographer boyfriend Dennis (Christopher Nicholas Smith). Kristi has a friend called “Toby” who gets mad if she talks about him, and of course there are strange noises happening in the house, and like always, someone has to record it. The multi-camera setup of Paranormal Activity 2 was pretty worthless, as many of the cameras didn’t pick up anything worth watching. In fact, many of the angles used functioned merely as cutaways, which did become effective when something appeared out of nowhere in the next cut. In this one, there are 3 cameras set up, one in the master bedroom, one in the sisters’ room, and the cool one downstairs attached to an oscillating fan, which offers an interesting “now you see it, now you don’t” effect. What the cameras pick up here are pretty cool, but not all that scary, although some scenes are pretty wicked. It’s that kind of movie. When you’ve seen demon scares for two movies, some will connect, most won’t. When the family decides it’s time to move in with Julie’s mom, this is where the movie is at its absolute freakiest, although the explanation we get for the paranormal is kind of, “meh,” the ending is pretty effective. It is also where the use of the camera becomes it’s most ridiculous. In the previous entries, we didn’t have too many scenes where someone holds the camera and takes it with them everywhere a la The Blair Witch Project. This one has a lot of scenes where dropping the camera would be an involuntary response, but crazily enough, the camera makes it everywhere. Now, by rule, we need to see what happens so we can be properly entertained, informed, and scared, but when you think of the situation, it pegs your ridiculous meter pretty high (it was also ridiculous in Blair Witch and Cloverfield, but it still worked as a technique). Now, the series has a lot of explaining to do, unless it wants to risk a 4th prequel with 8mm film and the 70s. Remember, the first film ended with a cliffhanger, the second one ended with virtually the same cliffhanger, and now there’s a lot of questions brought up by this third movie where the gaps in Katie and Kristi’s adulthood knowledge become a troublesome plot complication. Anyway, this is clearly one of the best third movies in a series, and it certainly ranks as one of the best, if not the best, third horror film of a series. Being lo-fi helps horror’s delivery so much. I hope they never change that aspect. This isn’t great, with a lot of flaws, but overall, a good time at the movies, especially if you see it with a large, terrified crowd.